As regular readers know, I have an anti-authority, anti-institutional streak in both my personality and in my theology. My sympathies tend toward the anarchical, the kingdom of God as that place where there is no "lording over" others, where the only "power" is the washing of feet. My sympathies run so strongly in this direction that I devote a whole chapter in Reviving Old Scratch linking the use of power to the demonic. I frequently equate "the principalities and powers" with satanic activity in the world, viewing all organizations, institutions and nation states with the greatest of suspicion. Beyond my anarchical ("no rule") impulses, my theological inclinations are also very Anabaptist, seeing the church as a polis separate and apart from the wickedness of Babylon--the Empires of our age, America chief among them. My problems are easy to see. If the nation state is the principality and power of Babylon, the satanic hand working oppression and injustice in the world, then why am I supposed to be in submission to it? If this principality and power is wicked how can I think of this power as being appointed and ordained by God? And differently but relatedly, if I'm committed to non-violence and pacifism how am I supposed to approve of the state using the sword in the execution of judgment? 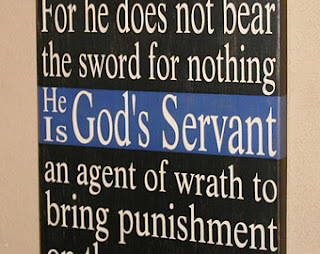 Even worse, how am I to understand that the state's use of the sword is approved of by God? For Christians like me--anarchical, Anabaptist, pacifist--Romans 13 is one of those heartburn texts. Texts that you'd rather ignore and/or qualify. To be clear, no matter what you believe as a Christian you have your own suite of texts that give you heartburn. Romans 13 happens to be one of mine. And yet, over the last year I've been rethinking my heartburn over Romans 13. I've encountered a few different things have have helped create a window into what I think Paul is getting at in Romans 13. Not that I have any final or conclusive answers or have had a change of heart--the text still gives me heartburn--but my qualms about Paul's claim that the nation state is "God's servant for your good" have been interrupted a bit. So I'd like to share a few posts about about how I've been interrupted by Romans 13, about my heartburn over my heartburn.